The last thing you expect when you meet the person you love is for that special someone to end up abusing you, but that's sadly a reality for many women - both in this country and abroad. So when Inspector Jack Rowlands of the Met Police saw a scene that truly epitomised the brutal actuality of domestic violence, he decided to show the world. Inspector Rowlands' tweet looks like a scene out of a twisted horror film but what it actually is is a lot more terrifying - the crime scene image is sadly just part of life for one domestic abuse survivor. 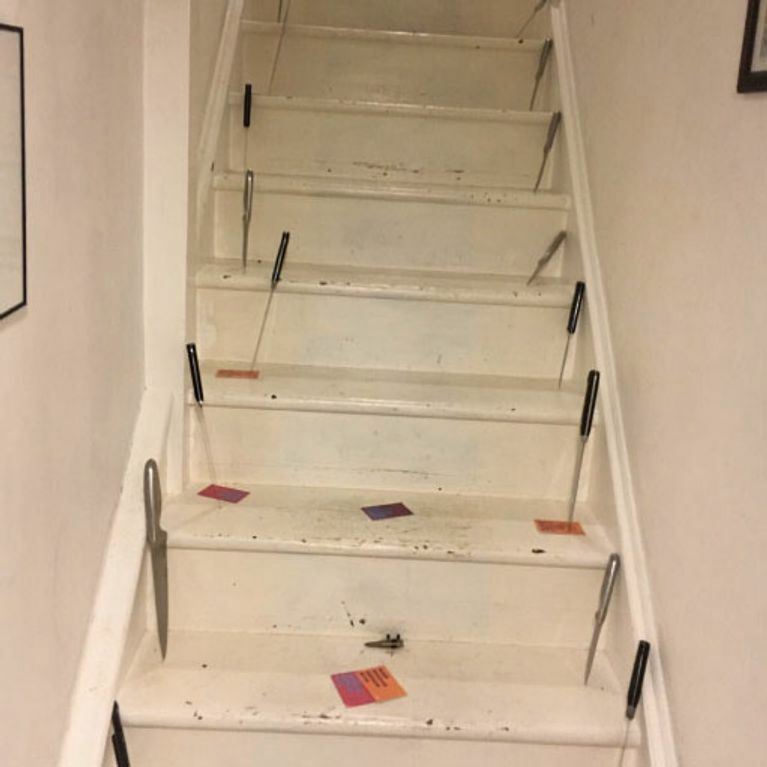 The picture shows a staircase inside a home, where every step has been studded either side with a sharp kitchen knife, each one plunged deep into the wood of the stairs. In the centre of one step lies what appears to be a bullet or perhaps a replica and several other steps are scattered with orange and pink cards, maybe from a board game. "A few weeks back a colleague of mine went to a domestic assault and found this when he entered," the inspector captioned the image shared on Twitter which has since been retweeted and liked 100s of times. "Male arrested and charged. Life saved." A Met spokesperson then went on to confirm that a 42-year-old male had been arrested at the home and charged with common assault. After the image received much attention from shocked members of the public, Rowlands said: "Lots of comments and shock about this picture. An image that raises the awareness of domestic violence and how much more is needed to be done." According to nonprofit Living Without Abuse, domestic violence affects 1 in 4 women (and 1 in 6 men), and leads to around two women being murdered every single week. Domestic abuse accounts for 16% of all violent crime and has more repeat victims than any other crime, but is the least likely crime to be reported to the police. If you or someone you know is experiencing domestic abuse, please call the National Violence Helpline on 0808 2000 247. Understanding Clare's Law: Can it protect women from domestic violence?